Jeffrey C. Chu is the co-founder of this Los Altos, California, based company. He is an expert in satellite monitoring and interference mitigation technology, having co-invented and managed the first generation of such systems for the United States government. Mr. Chu received his Bachelor degree in Science from Harvey Mudd College, and his Master Degree in Electrical Engineering and Computer Science from the University of California, Berkeley. Rick Lober joined Hughes in late 2008 as Vice President and General Manager of the Defense and Intelligence Systems Division (DISD). He has over 25 years experience with both COTS-based and full MIL communications and intelligence systems starting as a design engineer and progressing to a P&L executive. He has previously worked at Cubic Communications, Inc. and Watkins-Johnson Company. Mr. Lober received his BS and MSEE degrees from the University of Illinois, Urbana. Giles Peeters spent 19 years working as a communications specialist for the United Kingdom Ministry of Defence, before moving to the private sector to consult for organisations such as NATO, on Blue Force Tracking (BFT) requirements. Now Defence Sector Director at Track24 Defence, Peeters is the driving force behind the launch of the companys new, commercial-off-the-shelf (COTS) Blue Force Tracking solution, Situational Command & Control (SCC). Thomas M. Pirrone is the Vice President of Customer Development for SSC Universal Space Network (USN) and North Americas chief customer service officer. He joined USN in 1997, which was acquired by Swedish Space Corporation (SSC) in 2009 and today serves as a vital partner in the Companys global satellite ground station network. During this time, Mr. Pirrone led marketing, business development and customer service programs that helped USN achieve a leadership position in the commercial and civil space markets. Prior to joining USN, he served for eight years as general manager of GDP Space Systems, a ground station products manufacturer serving NASA, the commercial space industry and the Department of Defense (DoD). Other career highlights include engineering, sales and management positions with Aydin Corporation (now L-3 Communications), where he played a critical role in the design and implementation of satellite ground station equipment for NASA and the DoD. 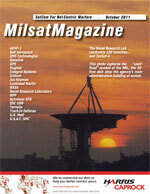 Celebrating the launch of the 100th satellite into orbit with the launch of TacSat-4, September 27th, the U.S. Naval Research Laboratorys Naval Center for Space Technology commemorates a pioneering and fruitful space-based research program that got its start some 65 years earlier. The NPP mission is the bridge between the nations Earth Observing System (EOS) satellites and the next generation Joint Polar Satellite System (JPSS). NPP will help scientists understand, monitor and predict long-term climate behavior and also provide vital near-term weather data to meteorologists. The mission hosts a suite of advanced-technology remote sensing instruments that will provide critical data for the nation. There are a number of international naval forces operating anti-piracy patrols off the Horn of Africa, but the area of operations and the number of merchant ship targets are too large for the naval forces to prevent pirate attacks. The belief is that the engineers and scientists of Nazi Germany were the first to consider the possibility of placing a (piloted) satellite in orbit for military reconnaissance purposes. The U.S. Air Forces Advanced Extremely High Frequency (AEHF) system is the nations next-generation military strategic and tactical relay system, which will deliver survivable, protected communications to U.S. forces and selected allies worldwide. When fully operational, the system will consist of four cross-linked satellites, a ground mission control center and user terminals. The AEHF system provides joint, interoperable, assured connectivity for warfighters in operations in all levels of conflict  a capability not available through other planned military communication networks. The satellite serves as a smart switchboard to establish, maintain, reconfigure and disassemble required communications circuits as directed by the users. The terminals will provide encrypted voice, data, teletype, or facsimile communications. One key to the success of this communications satellite is the ability to provide reliable, high speed, secure, anti-jamming, survivable tactical communications capability. The AEHF beam-forming network (BFN) is at the heart of one of these on-board systems.